character, or custom; and "logos", meaning study. In this post we will see another book in the series Science For Everyone. This one is titled Ethology – What Animals Do and Why? by Igor Akimushkin. Igor Akimushkin is widely known in the USSR as a popularizer of biology. He is the author of over sixty science fiction books, including some for children, and many have been translated into the languages of peoples of the USSR and foreign languages. They describe the wonderful world of nature, awaken us to the marvels that exist just beyond the thresholds of our own homes, and explain the latest discoveries in biology. The series called “The Animal World” is particularly inter- esting having been awarded first Prize at a national contest held annually in the Soviet Union by the “Znaniye” society. This book was translated from the Russian by Pyotr Aleinikov and first published by Mir Publishers in 1988. This book was on the wanted list of Science for Everyone titles for quite some time. I have uploaded it here  Feel free to upload elsewhere too. Thanks! All credits for making this book available to us goes to Sanjeev. My many thanks to him for this!!! You can get the book here also (filecloud). 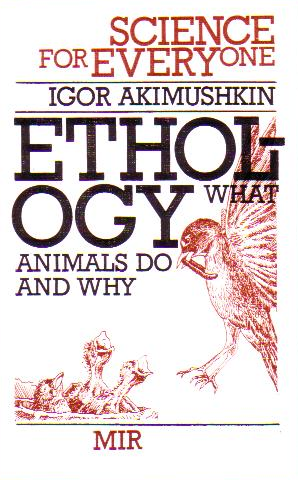 This entry was posted in books, life sciences, mir books, mir publishers, science, science for everyone, soviet and tagged animal behavior, animals, cognition, communication, ethology, mir publishers, pheromones, territories, tropisms, zoology. Bookmark the permalink. 3 Responses to Science for Everyone – Ethology What Animals Do and Why? A missing one is available now. 2. Thanks goes to Scantailor – Amazing free software without which it is impossible to create clean scan files. All , consider donating whatever little you can in its Sourceforge page. Thanks Gordon Freeman for this gem! Hopefully we will soon complete the Science for Everyone series! !